Yesterday I did my best to begin answering the question commonly asked by beginners to this hobby – ‘What is the best credit card for earning Avios points?’. Today I wanted to update, in light of recent card closures, my list of the best on-going earning rates. Because you can earn Avios points both directly and indirectly (eg via Tesco Clubcard or American Express Membership Rewards), the list of possible cards is longer than most people think. Part 1 of this article comparing sign-up bonuses was the most important part of the exercise. The easiest way to build up your Avios points, after all, is through multiple sign-up bonuses. It is also worth running over the various earning rates. For simplicity, I have separated these into ‘best American Express card for earning Avios’ and ‘best Mastercard / Visa for earning Avios’. Before you apply for anything, though, consider the size of the sign-up bonus and annual fee as well as the earning rate. Some cards offer a better sign-up deal if you are referred rather than apply direct – you will find full details of referral deals on the ‘Credit Cards Update‘ page of Head for Points. Let me be very clear on one point. I am not suggesting that the best use for the points from all of these cards is to transfer to Avios. Frankly, you’d be crazy to convert 50,000 IHG Rewards Club points to 10,000 Avios when you could get a valuable hotel stay out of them. However, I have listed all of the options for completeness. This article does not factor in the value of long-term incentives such as the British Airways American Express Premium Plus 2-4-1 voucher or the IHG Rewards Club Premium Mastercard free night voucher. You should also think about these perks when deciding where to put your long-term spending. All of these cards carry a 3% foreign exchange fee when used abroad. If you want a dedicated credit card to use abroad, take a look at the Virgin Money Travel Credit Card (click here). This card is free and charges NO foreign exchange fees. It also offers 0% interest on purchases for 12 months and 0% interest on balance transfers for 12 months, with no fee. Representative APR 19.9% variable. Best sign-up bonus (10000 points) for a ‘free for first year’ card. 1 Membership Rewards point = 1 Avios. You also receive double points on foreign and airline spend. You get 10,000 bonus points on renewal when you spend £15,000 per card year, equivalent to an extra 0.66 points per £1. Representative APR 57.6% variable including the annual fee (free in year 1) based on a notional £1,200 credit limit. The interest rate on purchases is 22.9% APR variable. Full Amex Gold review. Best overall card for long-term spending due to the value of the 2-4-1 Avios redemption voucher. Double points on British Airways spend (3 per £1) plus the 2-4-1 Avios redemption voucher when spending £10,000 per year. Representative APR 76.0% variable including £195 fee based on a notional £1200 credit limit. Full BA Premium Plus review. 3 points = 1 Avios, but you get a 25% bonus when converting 60,000 points at once. Representative APR 39.7% variable including £75 fee based on a notional £1200 credit limit. Full Starwood Amex review. Best card to get when you are planning to cancel an Amex Gold or Amex Platinum, as it keeps your Membership Rewards points alive. 1 Membership Rewards point = 1 Avios. Full Amex Rewards review. 1 Membership Rewards point = 1 Avios. £450 annual fee albeit offset by a very wide range of travel perks. Full Amex Platinum review. 2-4-1 Avios redemption voucher when you spend £20,000 per year. Representative APR 22.9% variable. Full BA Amex review. 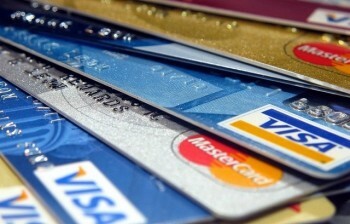 Best Visa / Mastercard if you meet the qualifying criteria. This card is only available to HSBC Premier current account holders and requires substantial savings or investment products to be held with HSBC to qualify. Representative APR 59.3% variable including £195 fee based on a notional £1200 credit limit. Full HSBC Premier World Elite review. This card is only available to HSBC Premier current account holders and requires substantial savings or investment products to be held with HSBC to qualify. Representative APR 18.9% variable. Full HSBC Premier review. 2 IHG Rewards Club points per £1. 10,000 IHG Rewards Club points convert into 2,000 Avios. Double points on foreign spend. £99 annual fee. Representative APR 41.5% variable including £99 fee based on a notional £1200 credit limit. Full IHG Premium Mastercard review. Best free Visa / Mastercard for earning Avios points. 1 Clubcard point per £8 spent per transaction. Note that your actual earnings rate will be lower because each transaction is rounded down to the nearest £8, offset by the fact that you earn double points for shopping in Tesco. Representative APR 18.9% variable. Full Tesco Mastercard review. 1 IHG Rewards Club point per £1. 10,000 IHG Rewards Club points convert into 2,000 Avios. Representative APR 18.9% variable. Full IHG Mastercard review. Just received new Amex Gold (credit) – how do I get bonus MR for taking out a supplementary? Ah interesting…took a punt as had worked with plat previously but no bonus even though supp has come through the post. Hopefully they’ll appear next week. just apply using the normal mechanism. For certainty wait to be invited by email. If you want to take a punt just apply via your Amex account. OT – does anyone know what will happen to the Lloyds upgrade voucher going forward when avios.com ceases to exist? I have no need to use it yet but am worried it will disappear. You’ll to have to call in order to use it. I would take a screenshot of it in your Avios.com account to be safe. ‘Disappear ?’ .you must be joking……all you have to do is call up Avios , they will have your details……easy. Can anyone tell me if I can get an American Express Platinum card for my Business ( at £450) and also a British Airways Premium Plus card ( at £195) in my own name ? The priority pass, hotel benefits etc look good on the American Express Platinum card but the BA card has a 2-4-1 if £10k is spent within a year which is attractive to me. I’m also not sure if I should be looking at the Amex Platinum for Business or just the ordinary one . What is the difference between the two? You can hold both as they use different reward currencies. Get the Platinum first then refer yourself for the BAPP for 18,000 MR. Hotel benefits not so good now that Marriott have dropped out. Look at my reviews (under ‘Favourites’ tab or search). Basically Plat Bus has better travel insurance and a higher sign-up bonus but a worse Priority Pass (no free guest) and worse hotel benefits (only two status cards). There is an article on this in the pipeline. The new Virgin Atlantic credit cards, have they now resolved their issues with rejecting people with good credit history now? Seem to have. I applied about a fortnight ago and had to wait 48 hours for a ‘considering your application’ review but was then accepted. I’m Experian 999, no recent applications, no bad debt, never missed a payment etc. and something still prevented an immediate approval – still at least it didn’t take long. They have resolved the issues with the pre-check ‘test’ by removing it from the application page. Which is good, because it was bull and genuinely had no predictive value of whether you were accepted. The current trend seems to be saying that you are rejected but then the card turns up. I think that all rejections are automatically now sent for a manual review by someone with a brain. Slightly OT – I’ve received updated T&Cs from Lloyds today for my avios rewards cards, Amex & MC, expected the worst (i.e. notification that they’re being withdrawn) but pleased to see that all remains intact, including fee free foreign currency transactions. Anyone know the latest on the anticipated demise of these cards? I called them when I got the new Ts and Cs last week. They said they have no set date for withdrawing avios and/or upgrade voucher, but we will get 90 days’ notice of any changes. I’m sure I read in the new t’s and c’s that they can make a change with 30 days notification so maybe not as long as you think.. I could be wrong I only skimmed them when I received them in the post. I am planning to use it as my main card, as usual, when I go on holiday in October, so it will probably have been withdrawn by then. I think it important to take into consideration what percentage of you annual spend you estimate you put through American Express (With much lower acceptance rates out USA) V’s Universal acceptance of MasterCard. HSBC MasterCard may have lower point to pound rate but if you can spend 100% annual spend on the card as it accept everywhere it can out balance slight higher point rate on Amex. Especially if you only want to pay one annual fee. It’s not an either/or decision though is it? I’d consider £ amounts rather than percentage of annual spend. This website is amazing! I’ve read a lot but still have some newbie questions. If anyone knows the answers I’d be very grateful; we want to try and get enough avios points and a companion voucher for flights for our next holiday. Currently my husband has the BA Amex fee free card £20k spend for 2 for 1, I am a card holder on it. We want to get the BA Platinum with the £10k spend for 2 for 1 and the 25,000 bonus points. 1. Can I apply for the card and get the bonus points and then add him to my account as a supplementary card holder, or will that not work because he currently has an active card with them (which I am also named on)? If so, I guess we’d need to cancel that for six months and then reapply, which would mean six months of not earning air miles (would have to look at alternative card for avoid point earning in between). 2. We would be buying flights for the three of us (my daughter will be 16+). Would we be able to buy our tickets by using avios points (for one adult flight) companion voucher (for another adult flight) and then pay cash and or some avois points for the third adult flight? Presuming we could get three reward flights?